Plagued by personal demons throughout his life, when James Carr walked away from his career in the mid-'70s, few of his fans expected him to ever record again. However, with the help of his original producer and lifelong friend Quinton Claunch, James was able to record and release two albums during the 1990s which affirmed that, despite everything, he was still a force to be reckoned with. This CD compiles these two albums and adds a bonus of an update of his 1966 Goldwax essential 'Pouring Water On A Drowning Man' - one of the last recordings James made prior to his untimely death in 2001. 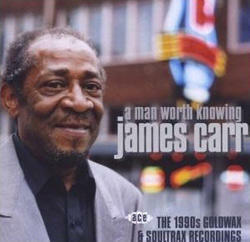 The vocals and songs on this CD are very much vintage James Carr.